Certified Service Dog and Pet Dog Trainer: Morgance Ellis is well recognized as an active professional level member of the International Association of Canine Professionals, (IACP) an internationally recognized dog training organization. She is a IACP certified service dog & pet dog trainer, pro #3782, CDT, CDTA, PDTI, CSDT. Morgance proudly serves as a member on the IACP Service Dog committee. 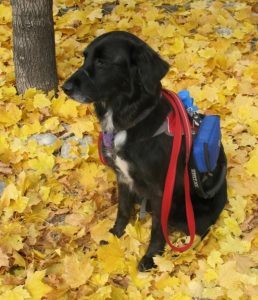 She is deeply and passionately involved in the world of Service Dog work both, locally, nationally and internationally in regards to all laws, regulations, policies, obedience and task training, and education. 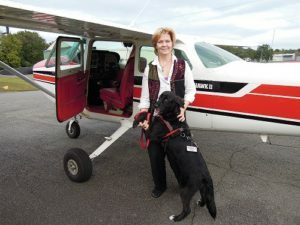 She developed a program K9 Wings Service Dog Airport Training Seminars that allows service dog teams to experience and train in an airport environment before they actually take their first flight together. This program helps service dog teams to understand and properly use, the Air Carrier Access Act (ACAA) regulations under the Department of Transportation (DOT), along with how to prepare, educate, and train themselves and their service dog, for air travel, before, during and after a flight. Lead With Your Heart Dog Training founded in 2005, was established to develop, promote and offer the highest standards of professional education, training and business practice in the dog training industry. LWYHDT advocates and supports all valid service dog guidelines of accepted use, training techniques and education. We understand that service dog handlers, dog trainers, public businesses, private entities, and the general public, all have rights and their interests and needs are equal in importance. We focus on tangible ways to communicate that tap into the heart of how norms can change at a deeper level, to help address and ultimately contribute to fostering new changes for today’s current needs. LWYHDT plays a vital role in the service dog community by guiding, training, testing and educating on laws, regulations, policies and respectful protocols that strictly follows the legal government definitions and requirements. A service dog’s proven value is no longer just limited to guiding the blind. They assist with medical treatments both visible and invisible for people with diabetes, PTSD, autism, physical mobility, deafness, brain trauma injury, life threatening food allergies, and seizure response, just to name a few. With any business, there are the unscrupulous that prey on the innocent, with the service dog and pet dog industry of trainers and suppliers certainly being no exception. LWYHDT stands strong in their position to find productive and effective ways of making appropriate changes that will curb the increasing abuse in the dog training industry and the counterfeit use of service dogs known as fraudulent misrepresentation. We encourage worldwide participation and interest to help us continue the worlds evolving understanding of the amazing work legitimately trained service dogs perform in making life changing differences for people with disabilities. Morgance has over 25 years of experience in the Dog Training Industry and is passionate about exceeding your expectations with both pet dogs and service dogs training and education, with quality results, superior customer experience and service. As a teacher, Morgance understands the importance to be a student herself, and strives to always keep up to date with the most innovative methods of working with dogs and people by attending workshops, seminars and webinars across the country. Before she opened her own business, she volunteered with many rescue groups helping to rehabilitate dogs so they can find loving, forever homes and continues to volunteer her time. Morgance has a lot of years working, training and showing horses and finds much of the skills in the horse world transfers over to training dogs beautifully, especially understanding how animals communicate through body language and energy.Her work emphasis the importance of adjusting the training and communication of each dog and owner so amazing relationships between species are formed. Training achievement – “The Engaged Dog” by Brenda Aloff. Training achievement – “Super Sniffer” diabetes alert dog training workshop by Debby Kay. Volunteer – Transportation Security Administration Disability (TSA) and Multicultural Coalition. We love our customers and welcome your feedback and suggestions. Talk to us on our Contact Us page. Copyright © 2019 Lead With Your Heart Dog Training. All rights reserved.